Thankfully, with the help of one of the fabulous passengers on the next P&O cruise to Kiriwina, another 50 birthing kits and birth certificates are winging their way to Kiriwina, thank you Kaye. The midwives have been chasing the delivery of the birthing kits. 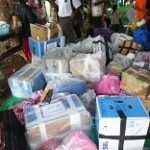 We need funds to deliver 5 boxes of kits from Port Moresby to Kiriwina which will cost $300 Kina. This converts to $125 AUS. PLEASE HELP. Remember all donations are tax deductible. To donate CLICK HERE. www.gdg.org.au/GiveToJ903N Thank you! Thank you so much Yarralumbla United Church, your support is essential to Caring for Kiriwina’s continued success. What a wonderful event. Hundreds of people rugged up in the cold single digit temperatures, Ah Canberra in winter. Photo Lynn Thomson, Winter Arts and Crafts coordinator. We will have a stall at the Yarralumbla United Church Arts and Crafts Fair Canberra. Come and take a brochure. Looking forward to seeing you there! 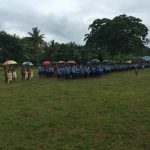 Caring for Kiriwina sincerely thanks all our donors for its ongoing support, and we are pleased to provide a brief summary of what we have been up to over the last year. Two passengers on a P&O Cruise that included a stop at Kiriwina, Trevor and Julie, contacted Caring for Kiriwina through our website caringforkiriwina.org. They wanted to deliver educational materials to school children, and also delivered a quantity of birthing kits which we sent to them in Brisbane prior to boarding. 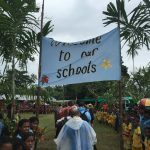 They were greeted with genuine Kiriwinan hospitality by the Kavataria elementary school, and later told us that this experience was the absolute highlight of their entire cruise. 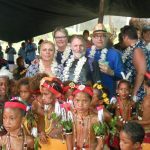 Caring for Kiriwina has historically focussed on the two main villages close to the mission station at Oyabia, which are Kavataria, Mulosaida. However it now supports more villages, and in December sent 30 uniforms, warm jackets and sloppy joes to the Village Health Volunteers from the following villages:, Kwemtula, Osesuia, Oyuvayova, Tukwaukwa, Wabutuma, Luya, Bwetalu, Loubuwa, Siviyagila, Kudukweikela, Kepwapu, Kuluwa, Buduweilaka. We are aiming to provide another 70 midwives with uniforms. These volunteers were on the beach at Kaibola to welcome the P&O guests in March 2016 (see below). Also sent in December, in addition to 50 birthing kits, were 30 solar powered torches (which are charged by a hand) to help with night time deliveries, thank you JK Electrics pty ltd for your donation. However our goal is to supply all the 100 midwives on the island with a torch or light that is sustainable, and we are currently looking for alternatives. Some of the Village Health Volunteers showing off their new uniforms. Caring for Kiriwina was contacted by Lone Asmin Sumbulla P&O cruise passenger and now our Brisbane Caring for Kiriwina member, who liaised with a small group of P&O cruise passengers who wanted to participate by taking items to Kiriwina to donate to schools. Once on Kiriwina, passengers and crew (about 20!) were transported to the other side of the island to personally deliver 50 boxes of donations they had collected from various donors across Australia. 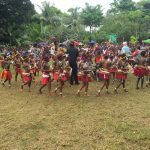 Caring for Kiriwina hosted the P&O guests and the local schools performed traditional dances and songs to entertain their guests and thank them for their generous donations. The schools that benefited from the donations of books and pens were Losuia Primary School, Oyabia Elementary School, and Oulakai village school. Oulakai village school is for young children between 3 and 5 to prepare them for elementary school, and they learn about the names of stars, names of months, names of wind and other forms of learning in the Kiriwina language. These children learn ‘under the trees’ (Oulakai) and that is where the name of the school was derived. They do not have a proper classroom. Caring for Kiriwina would like to thank all those passengers who donated to the wonderful Kiriwinans and sent these brilliant photos back. Paula, Jennifer, Lynne, Ron, Gloria, Lorri, Christine, Claire, Jette & Niels, Doug & Jeannette, Terri, Mark & Sue, Jenni & Rob, Grahame & Lynne, Heather & Russell. We would like to especially thank the wonderful Joanne from P&O and our fabulous new honorary recruit Lone, what a star! 200 birthing kits delivered, provided by Susan Thomas (WOW!). Susan is currently working on an additional 200 kits. to care for the people living on the Kiriwinan islands, in particular to focus on the health of pregnant women, women in childbirth, newborn infants and children. 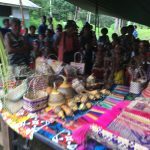 In practical terms, this means donations to Caring for Kiriwina will now need to be made to the Global Development Group quoting the Caring for Kiriwina Project. Please visit the How to Donate page on this site. They are now tax deducible! hearing aids – Jason Toposona is a Health volunteer working as the Health Extension Officer (HEO) in Kavataria Village. He is the closest thing to a doctor on the island, and has worked on a volunteer basis at the local health clinic. However poor hearing is impacting on his ability to continue in this role, and we are liaising with a specific donor to provide funds to fly Jason to Port Moresby for hearing tests, including funds for the hearing clinic and the purchasing of hearing aids. It’s official! Caring for Kiriwina is now a registered Charity. Caring for Kiriwina is a partner for Project J903N Caring for Kiriwina, PNG with Global Development Group (ABN 57 102 400 993), an Australian DFAT approved Non Government Organisation carrying out quality humanitarian projects with approved partners and providing aid to relieve poverty and provide long term solutions. Global Development Group takes responsibility of the project according to DFAT rules providing a governance role and assisting in the areas of planning, monitoring, evaluating and auditing to ensure the projects are carried out to DFAT requirements. Part of our wonderful Caring for Kiriwina in country team in uniform. As you can gather from all these messages of thanks it takes many people to make this charity a success. On the ground working tirelessly for others we have to especially thank the mid wives and the people of Kiriwina. Thank you Toks, without the continuing support from you and your family Caring for Kiriwina would not be the successful, smooth running professional charity that it is today. Another 50 birthing kits are winging their way to Kiriwina, they should arrive before Christmas, fingers crossed. Thank you to the Team at Caring for Kiriwina who work tirelessly to keep a constant supply of disposable Birthing Kits and Birth Certificates in production. A special thank you to Diana, Kylie (and Tom) Adams who do such a fantastic job putting the kits together and the essential support we receive from the Yarralumla Uniting Church Canberra. THANK YOU! Early Christmas Present for Mid Wives – new uniform Polo shirts. We have just sent the first 28 new Polo Shirts up to the leading group of Mid Wives on Kiriwina. We still have another 72 Polo Shirts to save up for… donations welcome.